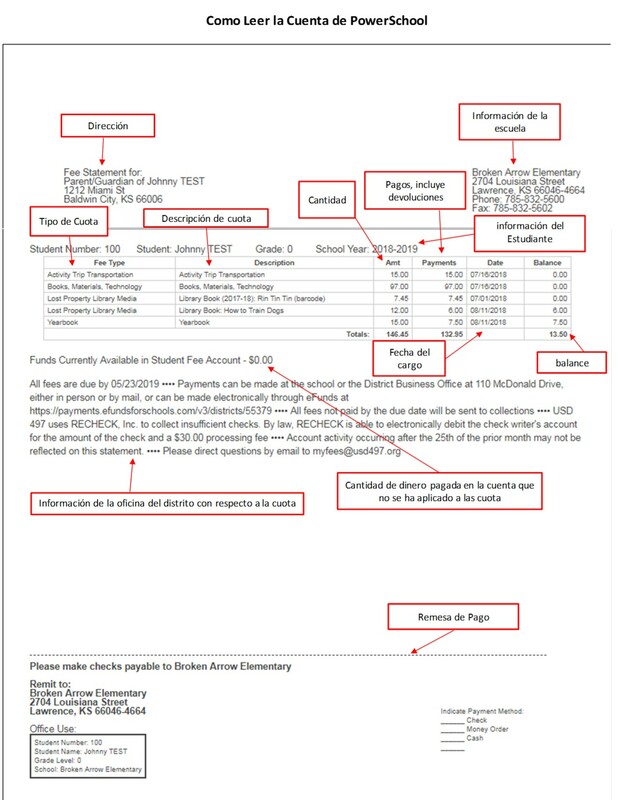 If you have questions about payment of school fees, please contact the administrative assistant at your child's school or contact the Business Office staff listed on this page. You may also e-mail your question to myfees@usd497.org. Please include your name, your student's name, the school they are attending, a phone number where you may be reached and the best time to contact you along with your question. Someone in the Business Office will respond to you as quickly as possible. For guidance on how to read the PowerSchool statement, please select the correct option on the right side of this page. Fees for the 2018-19 year are due by 05/23/2019 and not 05/23/2018 as shown on the statements. We apologize for any confusion and have corrected this for all future statements. e~Funds is now available for fee payments for the 2018-2019 school year. We encourage you to wait until you have received your statement(s) before paying fees. All students that were attached to your e~Funds account prior to and during the 2017-18 school year are still attached to your e~Funds account. If you do not see fees associated with one of your students, please check their student ID number. If their student ID number in e~Funds begins with a zero you will need to re-attach that student to your e~Funds account with their PowerSchool student ID number which does not begin with a zero. You may remove your student with the leading zero from e~Funds. Please do not make payments on e~Funds for any other school year. Q: I have been approved for reduced-price or free Child Nutrition Program benefits. Why am I still being charged for other school fees like Activity Trip Transportation and Books, Material, Technology? A: School fees are not automatically waived. Before the Food Services Department can share your Child Nutrition Program benefits with the Business Office they need permission from you to do so. The Federal Government (USDA) requires a "Waiver of Confidentiality" be on file each school year granting permission to share Child Nutrition Benefits for other reasons, for the children listed on the form. Once permission is granted, the Business Office can review and grant waivers for applicable fees as outlined on the 2017-18 Consent for Disclosure form. The Spanish version of this form can be found here. Q: Do Lawrence Public Schools charge fees? A: Yes. USD 497 charges basic fees to all students. Additional fees and course fees may be applied for secondary students, depending upon their activity level and course selections. Fee amounts are approved by the Board of Education. Books, Materials, Technology (textbook rental, technology (student use of computers and access to the Internet) and instructional materials (for example: newspapers, magazines, workbooks, art supplies, APPS, and other consumable items, etc.)). Activity Ticket (assessed for students in KSHSAA sponsored sports and co-curricular activities, as well as for students who request an activity ticket). More information on Activity Tickets can be found here. Please review the High School Planning Guide and Course Description Book for courses that require additional fees. Q: If my student attends only part of the year, do I pay fees for the full year? A: Basic fees are pro-rated on a quarterly basis. If your student attends one day of the quarter, fees are due for the quarter. Special fees and course fees are not pro-rated. Q: How are fees assessed for students who attend school for less than a full day? A: Fees for students who attend less than a full day will be pro-rated according to current policy set by the school board. Special fees and course fees are billed at 100%. Q: Can my fees be waived? A: If you receive a letter form USD 497's Food Services Department approving your student's meal prices as free or reduced, you may be eligible to have certain fees waived. Fees eligible to be waived are basic fees, co-curricular fees, participation fees, course fees, instrument maintenance/rental, activity ticket, and cap & gown. If you wish to have your fees waived, both the Approved Free and Reduced-Price Lunch Application and Form 3E - Consent for Disclosure must be on file in the Food Services Department. These forms, in English and Spanish, may be found here. Q: How do I pay for my fees? A: The school office or district office accepts checks, cash, cashier's checks, and money orders. See below for information regarding insufficient fund checks. Payments may be made online via eFunds. The eFunds program accepts electronic check and credit card payments. Q: When do I pay for fees? A: Payment will be accepted once the fees have been added to your student's account. USD 497 does not accept payments made prior to the fees being assessed. The only exceptions are for yearbooks, activity tickets, and parking permits. You will receive a monthly statement only if you have a balance due on an account. You may also check your balance using the PowerSchool Parent Portal. If your account carries a credit balance, you will receive a refund check from USD 497. Q: May I make payments for fees? A: Yes. Payments may be made in installments at your discretion. USD 497 does not have established payment plan dates, but requires your bill be paid in full by May 23. Not all fees are eligible for the payment plan. For more information, contact your school office. Q: What if my fees are not paid by May 23? A: Fees that remain unpaid after May 23 will be sent to collections. Silo Recovery is the district's collection agency. Q: What if my check is returned due to insufficient funds? A: USD 497 uses RECHECK, Inc., a check recovery company, for all insufficient fund checks. 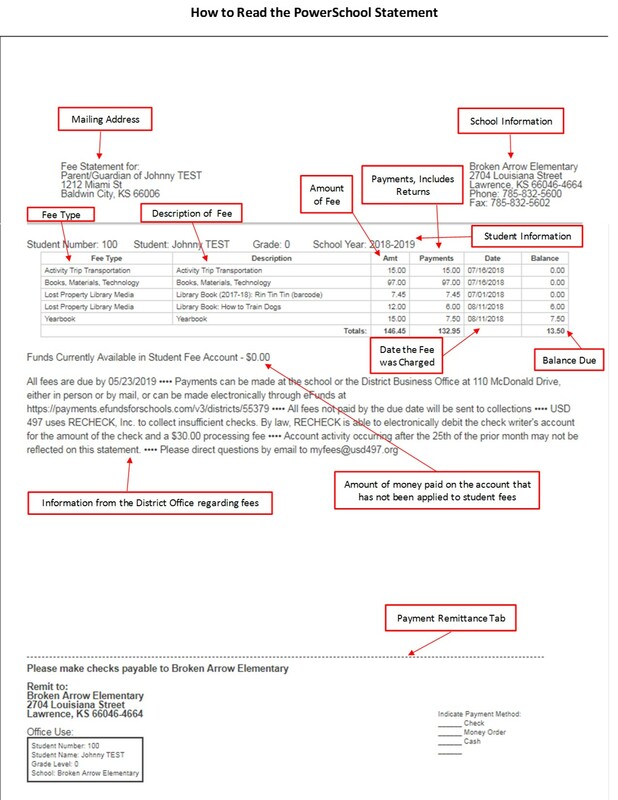 If a checks is returned due to insufficient funds, payment MUST be made to RECHECK, Inc. and NOT to the student's school or the district business office. By law, RECHECK, Inc. is able to electronically debit the check writer's account for the amount of the check and a $30.00 processing fee. Q: How does the eFunds program work? A: The eFunds program allows you to pay fees online at your convenience 24 hours a day, 7 days a week. Access eFunds through the PowerSchool Parent Portal. In order to pay online you will need to create a user account and add your student(s) to your account. Once your account has been set up, you may make a payment. When you select New Payments or Pre-Authorized Payments, you will be directed to a screen that shows all fees with a balance on your student's account. You may make a partial payment by adjusting the dollar amount listed next to the fees. To pay a specific fee, click on "add" beside the fee. The fees you have selected for payment will be displayed at the bottom of the payment screen. Please note that eFunds will not be available during summer to accomodate year-end processing (approximately from May 25 through mid-July). Q: Is there a fee for using eFunds? A: Yes, there is a small convenience fee charged by eFunds. Currently, the fee is $1.00 for each electronic check payment and $2.45 for each credit card payment. eFunds, a third party vendor, sets this fee and it is subject to change. Q: Where do I find my student's ID so I may use eFunds? A: You may call your student(s) school or you will find their ID on their fees statement.